I have daily currency returns. For each month, I have to find the return associated to the 5% lower tail quantile for each currency (the lowest return or the second lowest return). 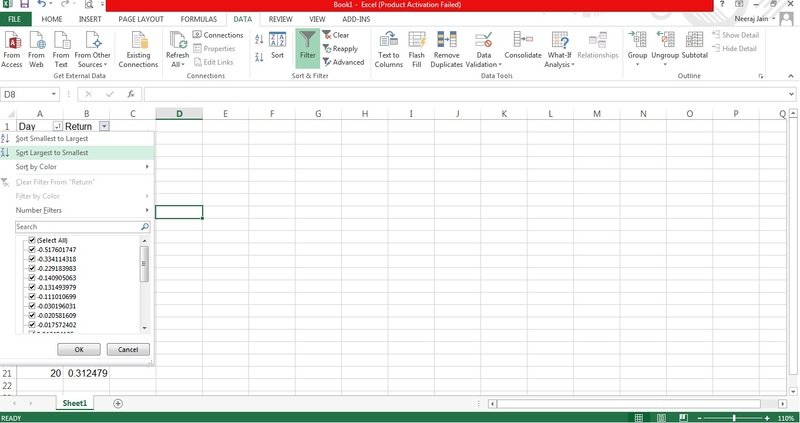 Could you please tell me how to do it using Excel? Just arrange your data in ascending or descending order using filter tab in Excel. If there are 20 days in each month, then select second lowest return for each month. Otherwise, You may use parametric approach to estimate 5% lower quantile for each and every month. Not the answer you're looking for? Browse other questions tagged returns distribution excel or ask your own question.